Thank you to all the folks who continue to buy the new book. No, I am not dead and your products are in the mail. To everyone else: no, I’m not dead, feel free to send me money. So does anyone have any doubt I’ve been spending the last few weeks immersed in my favorite pro sport? Please, have no doubts. Three weeks gone and the Seahawks have a 2-1 record, despite just terrible, terrible quarterback play and a practically medieval offensive game plan from the semi-sane Pete Carroll. What a bunch of orks. I’ve said it before and I’ll say it again: if the Seattle Seahawks were a Blood Bowl team they’d be orks…no ifs/ands/buts about it. I’ve been watching the ‘Hawks my entire life and it’s the only team that consistently makes sense. Now non-BB fans will take umbrage may take umbrage with this assessment, especially in light of the Seahawks’ history (well, up until the most recent coaching regime’s policy) of only carrying high character players on their roster. I’ve received comments on more than one occasion that such despicable creatures as orks should not be associated with the upright, generally scandal-free Seahawks. What these folks don’t understand, though, is that the humorous fantasy world of Blood Bowl isn’t built on the standard, “logical” fantasy tropes. We’re talking about a fantasy world that imagines fans of many disparate cultures (Chaos mutants and high elves and orks and hobbits) rubbing shoulders in the stands and waiting in queue together for half-time refreshments. It’s not a RATIONAL fantasy world; it’s a silly and entertaining one. Sure the orkish team might eat any fallen opponents that aren’t carted off the field fast enough…but I don’t think that reflects necessarily on any real life pro-football team associated with the orks. Just as an orkish Blood Bowl team doesn’t really reflect the nature of ork tribes found in “standard” fantasy games and fiction (i.e. bloody awful, genocidal maniacs championing the cause of Chaos and evil by their very nature). In a standard fantasy world, one wouldn’t deal with an ork tribe in any way except at the end of a sword…in the Blood Bowl universe, one might trade them a high draft pick in exchange for a star blocker and a guarantee they won’t snack on the Halfling cheerleaders in the 3rd quarter. SO, having said that what exactly IS my reasoning for assigning a specific fantasy race to a specific real world NFL team? If not the personalities, what am I looking at? Well, mainly the team’s history and tendencies, compared to the PLAY STYLE of the specific Blood Bowl team. Part of the fun of BB is the way that each team plays a little different (and sometimes a LOT different) from the other team types. For example, the orks…they’re superficially similar to the human teams (orks and humans are the “standard” types included with the game), except they’re a little slower and a little tougher. Each team has four position players available and three of these (the throwers, blitzers, and linemen) are nearly equal: same skills, same strength and agility, etc. However, the 4th position player (“catchers” for humans and “black ork blockers” for orks) are quite different from each other and being fairly cheap and plentiful they stock their respective teams’ rosters coloring the flavor of the game play for a particular species. Elves are agile and fragile, dwarves are bashy and smashy, etc. Orks are…well, they’re like a human team except a bit worse at the passing game and a bit better at the smashing…and, of course, they have their own “color” or “fluff” associated with their base “orky-ness.” High elves are vain, halflings are hungry little gluttons, orks are loud, thumb-fingered, violent-types. Not as strong/tough as dwarves or chaos or even undead teams with their mummies…but they make up for it with a certain mindless enthusiasm, known in the Warhammer universe as the Waaagh. That’s that home field advantage everyone talks about. The Seahawks have had that 12th Man advantage for a long time…since the 80s and the Kingdome. It’s given them a chance to beat a fairly good defense (historically, at home) for a long, long time…even in the terrible, terrible years of the 90s. Nothing is worse than watching a mediocre, middle-of-the-road team…you don’t get those wonderful high draft picks with an 8-8 record every year. This year, our orks have been developed into an extremely vicious mob of nature which, combined with the Waaagh of Century Link Field (known as the “the CLink” by the locals and “Da’ Klink” by our resident orks), makes for some fairly impressive blood bowl…er, football. And it’s allowed Seattle to get past a couple otherwise impressive teams (one dark elf, one human) in a fairly convincing fashion…all ref controversies aside. Unfortunately, the Seahawks don’t get to play sixteen games at home. And despite a great defense, despite a great running game, despite great special teams play…hell, despite having a 2-and-1 record and no serious injuries through three games…DESPITE all that, I find myself terribly frustrated with the season so far. Because, Carroll is one stubborn ork of a coach (if inconceivable upbeat and smiley) and he is going to stick with that rookie quarterback until we’ve lost enough road games to take us out of the playoff hunt. And every win just convinces him to keep the guy in one more game…despite the terrible, terrible play we’re getting from the position. Against the Packers we went three-n-out again and again due to the inability of the passing game and offensive play-calling that has been dumbed down to an orkish level because of coddling of the rook. Sure, Wilson threw a good TD pass to little Notre Dame goblin, Golden Tate…everyone can hit a 5 or 6 every now and then on a D6 pass attempt. But that’s not something to count on…nor can you count on the special play card “Confused Ref” to come up on the draw in every match. This is a team that is very good, and has a lot of good…championship caliber…pieces in place. And it’s probably going to lose a lot of games due to QB play. We’ve already lost one “winnable” road game this year to the Arizona Cardinals…a team I consider (traditionally) to be a hobbit team. Oh, don’t give me crap about that…since realignment in 2002, only 6 teams have a worse win-loss percentage, and they are much more of a high-flying offense when they’ve been good anyway (two traits…inconsistency and flying…generally associated with halfling teams, although Larry Fitzgerald might well be a wood elf ally). And I’ve seen good halfling teams plenty times before; there was one that made it all the way to a Spike! Championship match one year after knocking-off the highest scoring (skaven) team in the league in an especially memorable semi-final. Those that have been good have a formula similar to what the Cardinals are using this year: an aggressive, blitzing defense that’s not afraid to put the boot in over-and-over again (usually with a few “dirty player” skills mixed in). They knock people out and then (quite literally) fly down the field. But a good ork team should be able to beat a halfling team most days of the week…as the Seahawks have managed to do most years against Cardinals since the two landed in the same division ten years ago. And they didn’t in week one…instead, they played like a bunch of orks, throwing wide, dropping passes, being one-dimensional, etc. Ugh. We can beat up every team that comes into Seattle this year…Cowboys, Packers, Patriots, 49ers, etc…and still end up 8-and-8 again because the Waaagh isn’t present on the road to keep them in the game. The defense can still play good on the road…but they can’t play good enough to make up for a deficient offense every single away game. It just won’t work. But maybe I’m mistaken. Maybe I’m over-reacting to what I’ve seen the last three weeks. Maybe they’ll go on the road to St. Louis next week, and they’ll stomp all over the skaven in their lightless stadium, bottling up Steve Jackson and knocking out Bradford just like they did with halfling Skelton. It SHOULD be a winnable game for the Seahawks…as much as any road game in the NFL can be considered “winnable.” But if Jackson shows up as a rat-ogre instead of a storm vermin (either one is rough, by the way) and Bradford hits one or two of those new gutter runners for touch downs and the ‘Hawks are forced to play catch-up? If those blitzers Seattle has in their secondary go down with injuries of their own? ANYway…we’ll see what happens with the rest of the season: that’s why they play the games. I will try to enjoy the ride for as long as it lasts, and I’ll show up for the Waaagh and do my part as much as I can this year (not as much as I’ve been able to afford in prior years, though I WAS at the Cowboys game with my boy, I might add…he loved it). I just hope our orky strategy of play doesn’t get totally derailed by, well, by us playing like a bunch or orks. It’s a fine line, Blood Bowl fans. I'm surprised I haven't read anything on my regular blogs regarding the reissue of D&D 3.5 by Wizards of the Coast...not even a wry chuckle or sardonic remark. But perhaps, like me, you folks have all been uber-busy. Hell, I don't even know if I'll make my 20 year high school reunion this weekend (though part of that might be being generally broke)...but my morbid curiosity to see how far we've all slid over the years is pretty compelling. Anyway, I've been on single parent duty pretty much all week and work's been a total bear (AND I haven't had access to Ye Old Internet at work), so I feel I have a valid excuse for not mentioning it. But...well, I have a few minutes this morning in the quiet of sipping coffee with the wife, beagles, and baby all sleeping soundly upstairs (I'm running late for work anyway due to having to put the baby back to sleep around 6ish...no, no...nothing to give me sympathy about, I'd rather be doing that than going to work anyway...). It must have been Monday or Tuesday that Diego and I were over at Gary's Games in Greenwood (part of normal constitutional around the bario) when I spotted the hardcover 3.5s coming out of their recent shipment. I thought it was pretty bizarre to tell the truth...I mean I hadn't seen anything about it or announcements that WotC was going to do this (not that I follow WotC's news boards or anything but I selfishly expect other bloggers to do so and thus keep me informed of the latest-greatest). However, in scanning back through the internet it looks like there was some mention of this as early as July regarding a "premium edition" of 3.5 being released, similar to the commemorative AD&D books. Well, I don't know if the errata from earlier printings has been cleaned up, but these 3.5 books don't look especially "premium" to me...that is, they look exactly like the earlier issuance of 3.5, albeit shrink-wrapped and with $50 price tags (the folks at Gary's tell me the interior is the exact same). In fact, they look kind of like someone at the warehouse just found a few dusty piles of unsold books and decided to see if they could get one more cash infusion from the gullible public prior to the release of their D&D Next reiteration. The really amusing part (I really did have a good chuckle with Tim when I saw the books front-and-center on the "new book" shelf yesterday) is that they're still plenty of near-mint condition 3.5 books in Gary's used section. Previously those were being sold for $50 but now they've been discounted down to $30 or so...but wow, I can't figure why anyone would want to buy this stuff, new or used. I mean, don't the WotC diehard supporters want to own the latest version number (whether that's 4th or the soon-to-be 5th)? 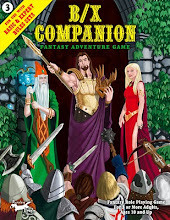 Haven't the disgusted 3.5 devotees already found their niche with Paizo and Pathfinder? Haven't the old geezers like myself already decided to spurn the whole lot and either play the oldest versions and/or write our own? To me, it's a bit pathetic (thought amusing, as said): it really does look like they're just cleaning out the closets and hoping to get a little scratch in the process...a kind of "last garage sale of the summer" kind o thang. Whether or not this is real, serious business stratagem of some sort...well, I really don't see how it can be. I mean, why would you do such a thing? How could this benefit the coming 5th edition (let alone the existing 4th?). To whose nostalgia is 3.5 supposed to appeal? Who exactly is the target audience? I really don't get it, but it does tickle my funny bone. Maybe it is supposed to be a joke...though I wonder at whose expense? Sitting in the bar, in a t-shirt and my phone reads its about 77 degrees and it feels quite a bit hotter. No, Seattle is not Montana but it's still sweat-worthy (town hasn't had rain in more than a month...ugh). I'm sure it will cool down by the Seahawks first home game (a week from Sunday) and I should probably be enjoying it now...but I get thirsty when it's hot and strong drink makes my head swimmy and my spelling messy. Well, messier than normal anyway. So, quick update before I begin. No apologies this time: my family (wife and child) got back in town Sunday before last after being gone a week-and-a-half and I've spent the time since mainly enjoying the pleasure of their company. Took a long weekend over Labor Day and travelled to Montana to visit the relatives and unwind a bit and did...um...pretty much ZERO writing when I was out there (though the wife and I did manage to power through most of Downton Abbey, season 2, on DVD. Best show I've seen from TV land since, perhaps, Firefly for sheer damn quality: acting, writing, emotion, art direction...good stuff and top notch). Now, well...the wife leaves for Paraguay again on Saturday and I am preparing to once again be a single parent for a week. What with the NFL season breaking into full force on Sunday, you can expect little blogging out of me in the foreseeable future. Well, anyway, I'm sure folks are anxious to know what I spent my 10 free days working on. Right? Sure you are. None of the above. I wrote a new game. Even had a chance to playtest it a couple weeks ago. 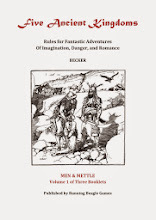 Basically I took a lot of the ideas I've been working with in D&D Mine, wrapped it around a turn-o-the-century (1900, not 2000) setting and added all the old school Lost World tropes found in Verne and Haggard and Doyle, etc. Dinosaurs, people. I don't know why but these days I have an unhealthy obsession with hunting dinosaurs with elephant guns. 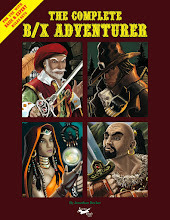 The great thing is, using a B/X starting point allowed me to simply adapt X1: The Isle of Dread as a near-perfect introductory adventure. I say "near perfect" because I grow more and more tired with "generic adventure modules." Not because they aren't useful or well-done but because the systems I've been writing lately all make the player characters (slimly out-lined though they are) more richly detailed...in such a way that they call for tailored adventures specially made for their own particular foibles and extravagances. For example, our Lost World characters (in the play-test) consisted of a debonair (if debauched and corrupt) Portuguese criminal, a disgraced and exiled Moscovian scientist-professor, and an American ex-pat, Davy Crockett-type living in Panama (these all created by the players...I don't like to play-test with pre-gens as part of the testing involves testing the chargen rules). While it was fairly easy to shoehorn the three together after a little discussion/consensus-building by the time they got to the "mysterious south Pacific island" I was wishing I'd set the whole adventure in the Amazon, preferably with ties to each character's background. It just would have made so much more sense. As it was, it was still fun and many of the rules worked (though I acknowledge the info I provided to the players was pretty damn scant: "roll this." "roll that." "take damage." etc.). However, there were definitely things that didn't work, especially with regard to motivation and the push-pull dichotomy I intended to set-up with PCs between ethics (Victorian or otherwise) and temptations to be bad. And while players (and designers) of indie-games will say "duh, you need to sculpt a game with those things in mind, not based on a wargame chassis, doofus," I know what I'm aiming for and one-off, premise addressing narrative game design is NOT it. Wait. Wait. "Fantasy adventure games?" Yeah. I'm getting tired of "story games" and "role-playing games" (the term...really) and I'm not very good at "war games" due to my somewhat over-competitive nature (my buddy Mike used to tell me 'it's not that you're a sore loser, you're just such a bad winner'). And, of course, the whole boxed-board game-thang of 4th edition really isn't my cup-o-tea. 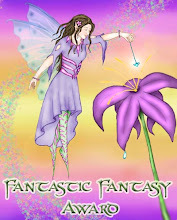 I want fantasy adventure. No, I'm not being dumb. Try to catch my drift from this point o view: it's not about being an interesting character. It's not. It's about doing interesting things. You can use your imagination to daydream about about being...well, pick your well-cut action hero celebrity of choice. But I can do that withOUT a game. What I can't do is have an imaginary adventure...where the plot is unknown and the ending is unknown and my reaction to events is unknown until they're presented. I want to have a fantastic, imaginary adventure...something outside the normal adventure of average life. Not that there ISN'T adventure...perils and intrigue and romance and whatnot...in daily life. There is (it really is a matter of perspective)...but still, you can't fly through space or fight trolls or wear a six-shooter on your hip in daily life (at least, you probably shouldn't). The fantastic experience, coupled with the (melodramatic perhaps) adventure is what I'm looking for. 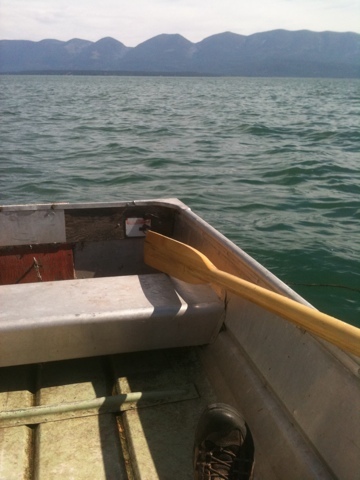 ...on Flathead Lake in Montana. Pretty good Internet for my smartphone; I figure the movie stars up in Big Fork have fixed the coverage for the whole area. Ah, well...back to rowing (not good to drift with the current to much! ).